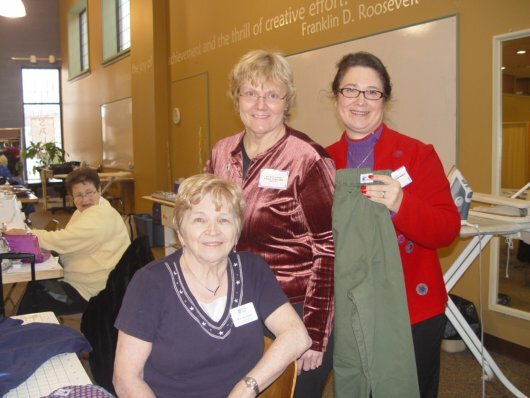 Pat Quintero, Nancy Leonard, and Diane Sampson posing with Diane’s first pair of slacks made to send off to wounded soldiers. Photo by member of James Larkin’s family. I have been sewing my whole life. Although it may seem like a solitary hobby, it is a great way to connect with people and to help those in need. Currently I’m a member of seven sewing groups around Metro Detroit, including my favorite Sew Much Comfort, an organization of volunteers that provides free adaptive clothing to service members from all branches of the military and national guard. We alter clothing for wounded soldiers by opening up side seams and sewing in velcro. That way their wounds can be treated by partially removing the clothing. Also the velcro allows for braces and bone halos to be worn. 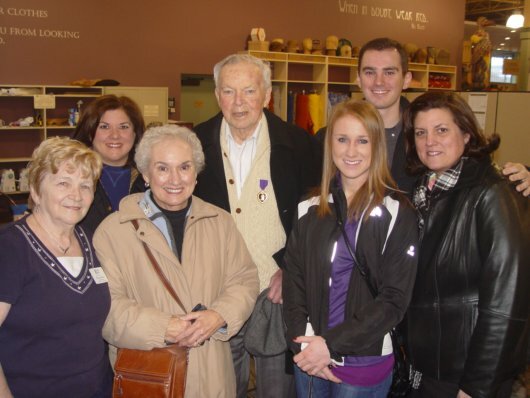 WWII veteran James Larkin (center) with his family and Detroit’s Sew Much Comfort leader Pat Quintero (far left). Photo by Diane Sampson. Here is a photo taken at a monthly workshop of our Sew Much Comfort group sewing at Haberman’s Fabric store in Royal Oak, Michigan. The gentleman in the photo, James Larkin, was there with his family to make a sizable donation and brought with him six family members (shown above). The whole family used Christmas gift exchange money and combined it to make that sizable donation and took the time to join their family soldier in person to make the presentation. John was injured in the Battle of the Bulge in World War II. With bandaged wounds, he was unable to leave the hospital for months, explaining there were no altered clothes available for him to wear. He was so pleased to see the pride in the eyes of every woman sewing along with the variety of items offered at no cost to wounded soldiers. Our freedom comes at a heavy price that so many soldiers unselfishly provide 24-7. How wonderful to be able to give back in some small way! Post by Diane Sampson. Diane is a retired elementary school teacher for Detroit Public Schools (DPS), where she taught special education, first grade and science for 31 years. She is extraordinarily active in her community. Seven sewing groups!? Do all of them involve sewing for community members? Or do some meet to do personal projects? Wow! What a wonderful project and way to use sewing to support others. I have just begun knitting and hope to learn to sew as well. I love the idea of using those skills for such a noble cause. Thank you for sharing your story! Great story and example of the many ways to help fulfill a need with financial support and by dedicating one’s time and talent and to a cause, and in the end new friendships are made. Thanks for sharing Diane! I love the name of your adaptive clothing sewing group! What an amazing way to bring dignity and comfort to people who have served their country.